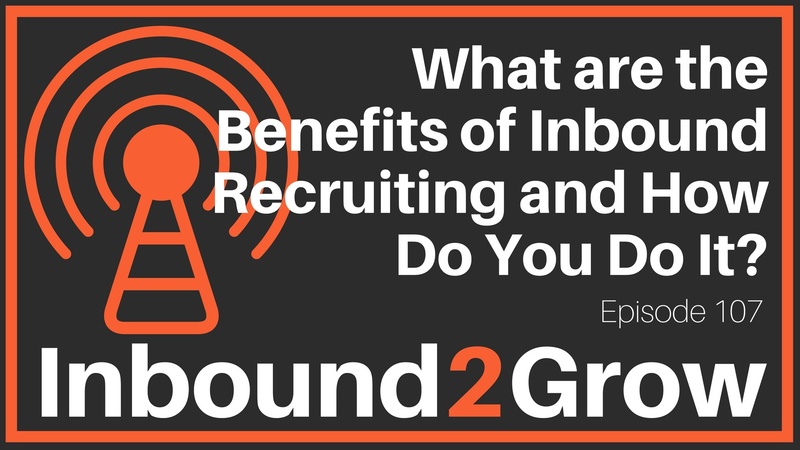 Episode 107: What Are the Benefits of Inbound Recruiting and How Do You Do It? Our buyers aren’t the only ones who have been fundamentally altered by the internet; employees have new expectations for their employers, and they are going about finding their next job in a drastically different way than they did 30 years ago. Inbound recruiting is a powerful tool for helping companies find and keep the ideal candidate. [0:45] Question: What are the Benefits of Inbound Recruiting and How Do You Do It? Inbound recruiting makes use of modern methods and tactics and applies them to finding and retaining the best employees. It used to be that when you needed a job, you picked up a newspaper and, as the job seeker, you found companies and tried to convince them you were the right person. Now, most peoples first step in a job search is to go online. Employees make use of sites like LinkedIn and Glassdoor to find companies that they want to work for, looking for companies with cultures that attract them. Modern employers can also make use of modern tools, growing their pool of candidates from a small local pool to a large national or global one. This larger pool means you can focus on finding the right candidates that will fit in with your company culture. The first step in inbound recruiting is creating an employee persona. Like a customer persona, an employee persona details the ideal candidate. More than just a list of skill and qualifications, an employee persona also outlines the characteristics that make an ideal employee. It is important to recognize that inbound recruiting can be a long-term investment. Your ideal candidate might not need a job right this moment, but inbound recruiting nurtures candidates so that when they are ready to look for a new job you are positioned to offer them a good fit. Also, don’t forget that every interview presents you with the opportunity to make either a positive or a negative impression on a candidate that will leave your office and go back out into the world, oftentimes sharing their experience. If you go into the recruiting process committed to being inbound and helping everyone, you can help that experience to be positive. While inbound recruiting can be rewarding, Todd wants you to know that it is also a lot of work. Recruiting is a significant time investment you must make when building an inbound culture.